At Haile Selassie High School in Kingston, Jamaica, less than 1 percent of students go on to college. An overwhelming majority of the 7th-to-11th grade students at the school are taking remedial courses. Students in a 9th grade reading class are working hard to attain a 1st grade reading level by the end of the school year; currently, many students are on a pre-school reading level. The school is flanked with murals that depict the alternative to successfully attaining an education: crime and eventual incarceration. 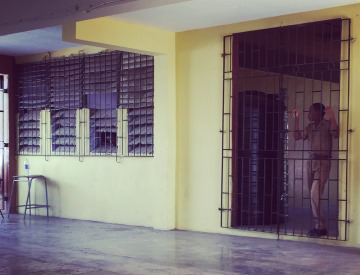 Doors made up of metal bars—similar to those one might find on a jail cell—flank each classroom, each door adorned with a metal padlock to deter theft. “The word education is not even a part of the conversation for some of our young men,” said Joseph Heron, dean of student discipline at the school. Much of this, Heron said, is because young men in Jamaica, like many of their U.S. counterparts, are struggling with an identity crisis. In Jamaica, many educational endeavors like reading and mastery of English and other modern languages are considered feminine pursuits. “I was confronted many times by students as if I were lesser because I simply do my school work and answer questions in class,” said Akeem Edwards, an 11th grade student at the school. Edwards, who will be graduating this year and hopes to attend Yale or Carnegie Mellon next fall, said he sees education as his ticket to a better life. For many of the students, education is not emphasized at home and certainly not as much for boys as it is for girls. “Parents are more strict on the females based on what they see in the news and they don’t pay attention to the boys,” said Rico Christie, a 10th grader at the school. Heron said that, in many cases, the parents of the students served by HSHS have not had the exposure to education to be able to instill in their students the necessity. “When we call parents to address these issues, the parents are also having similar identity crises,” Heron said. “If the conversation of education is not within the parents, it cannot be within the students,” he continued. Parents may instruct students to go to school, “but there is no process of caring” or investment in ensuring the students receive an education. But Heron quickly clarifies that the education level of the students is not reflective of their intellect. “Opportunity is the issue, not intelligence,” he said. Citing such opportunities as the International Colloquium on Black Males in Education, which was taking place in the same city but which his students were not attending, Heron said, “Most of [the HSHS students] will never get the opportunity to rub shoulders with people who are [professors, university administrators, practitioners, policymakers and others in positions of influence]. They’re rubbing shoulders with people who are carrying guns and” participating in illicit activities. “We have to create opportunities for our young men to be exposed to these things,” Heron added. It is in this spirit that the College Academy was created, which this year took a small group of U.S. scholars from the University of Wisconsin and Ohio State University to Haile Selassie High School to discuss opportunities in higher education. The students whom staff believed might have “an inkling of hope of attending college” assembled in the school’s multi-purpose room October 6 to hear current graduate students and long-time scholars talk about the college experience and pathways to higher learning. Despite immense heat and difficulty hearing the presenters (who were speaking without microphones over blaring fans hoping to circulate the thick air in the room), the students sat absorbing as much information from these visitors as they could. Other students—those whom staff believed would not be able to attend a university upon graduation from Haile Selassie High School—peered through cracked window vents and from behind bars that separated the auditorium from the corridors. Heron said he was “cussed out” by many students who were not selected to attend the program as they expressed their dissatisfaction with being excluded. But for those who did attend, even for just the two hours they were in the room, there was a noticeable difference. For some, like Edwards, the time spent at the College Academy reinforced the idea of going to college and re-ignited an excitement for learning. “They opened my eyes and presented [new] opportunities,” he said. The most important message he gleaned from the accounts shared was “it’s not about where you are now, neither is it about where you are going. It is about what you do once you get there,” Christie said.